With increasing age, the Hyaluronic Acid content of our skin decreases, reducing its capacity to stay moist and supple. Oil producing glands reduce their activity and the skin becomes dry. Thus, it loses its youthful glow and smoothness. With gradual loss of collagen and elastin skin looks aged. Dermal fillers contain Hyaluronic Acid (HA), a form of natural sugar that our body produces routinely. In fact, Hyaluronic Acid fillers are the most preferred form of dermal fillers due to their efficacy and safety reasons. 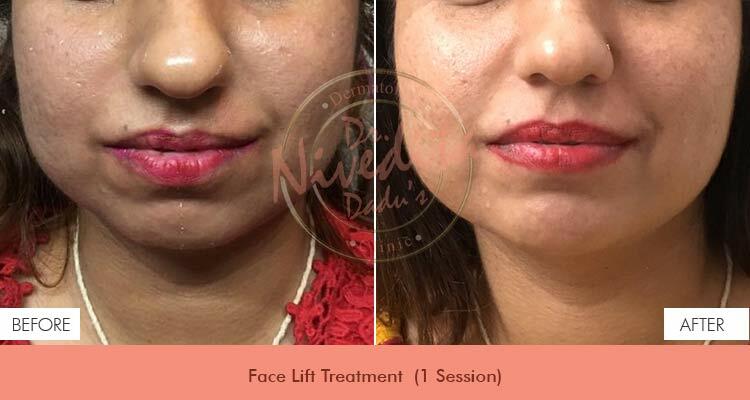 The filler is an injectable gel containing Hyaluronic Acid that restores youthful volume to cheeks, cheekbones, and chin, that have become thin due to weight loss or age-related facial fat loss. When injected into the skin’s layers, it fills up space and does away with the cosmetic imperfections.The results are immediate, soft, and natural looking. Hyaluronic Acid is used for aesthetic treatments and has been used by doctors for injection into arthritic joints to aid movements, as well as eye surgery. 1. Smoothening nasolabial folds for a youthful look. 2. Shaping your lips and making them look luscious and beautiful. 3. Diminish the lines around your mouth to look young. 4. Smoothening the skin under your eyes to remove the tired look.